The Trump administration's State Department is working to quash new legislation that would sanction international terror groups for using human shields, a battlefield tactic employed Hezbollah and Hamas, according to multiple U.S. officials familiar with the administration's behind-the-scenes effort to nix the legislation. While the new legislative effort to target terrorists who force civilians into dangerous combat zones quickly won bipartisan support on Capitol Hill, the Trump administration's State Department has quietly been working for months to kill the bill and prevent lawmakers from moving the legislation, multiple U.S. officials told to the Washington Free Beacon. U.S. officials familiar with the situation expressed outrage over the State Department's behind-the-scenes effort to kill the legislation, particularly in light of President Donald Trump's tough rhetoric on terrorists and efforts to thwart the regional groups. "The list of grievances is so haphazard and random, it feels like they just flipped through the bill looking for things to object to," one U.S. official familiar with the State Department effort told the Free Beacon. The source would only speak on background about the sensitive and ongoing situation. "So when you read their concerns, at the top are these huge things about the structure of the bill itself, then a random bullet point where they say we shouldn't tell people how many missiles Hezbollah has because that's scary, then back to saying that the whole bill is impossible," the source explained. A second U.S. official familiar with the matter confirmed the State Department's opposition to the legislation, telling the Free Beacon that officials in the department's legislative affairs office should have done a better job at responding to lawmakers' repeated requests pertaining to the bill. 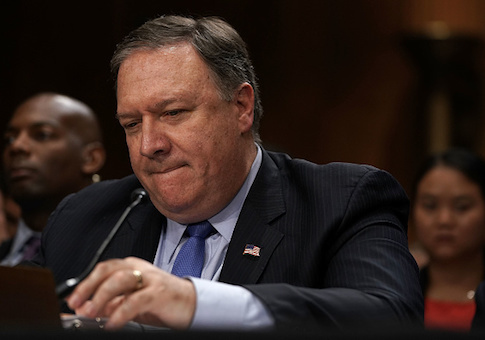 Other sources familiar with the State Department's efforts against the bill wondered if bureaucrats are working to undermine Secretary Mike Pompeo, whom they view as a likely supporter of the effort. The State Department's opposition is similar to separate efforts to suppress the publication of a major report on the number of Palestinian refugees that is believed to be a potential game changer in how the United States allocates millions in funding in the region. The American Israel Public Affairs Committee, or AIPAC, the nation's leading pro-Israel group, is one of numerous groups backing the bill. "This legislation is needed because terrorist groups—including Hamas, Hezbollah, and ISIS—are blatantly violating international law by placing their terrorist infrastructure amongst civilian populations and hiding behind innocent civilians as they carry out armed attacks," an AIPAC spokesperson told the Free Beacon. The State Department declined Free Beacon requests for comment, saying that it is the department's official policy not to comment on pending legislation. Cruz's bill—which is already backed by Sens. Joe Donnelly (D., Ind. ), John Cornyn (R., Tex. ), Richard Blumenthal (D., Conn.), and Marco Rubio (R., Fla.), among others—outlines how regional terror groups continue to employ human shields in a bid to inflate the number of civilian casualties. "America, Israel, and our other allies are engaged in a fight against radical Islamic terrorist organizations, from Hamas and Hezbollah to al Qaeda and ISIS, who cynically use human shields against us," Cruz said in a statement when the legislation was introduced. "Unfortunately, organizations like the United Nations incentivize this barbaric tactic by blaming civilized countries, who do everything possible to avoid civilian casualties, for whatever civilian casualties that do occur," Cruz said. "The United States should hold accountable the monsters who commit these war crimes. This bill will impose consequences on those who enable and facilitate the use of human shields." This entry was posted in National Security and tagged Mike Pompeo, State Department, Terrorism, Trump Administration. Bookmark the permalink.